Whatever the day throws at you, these men's leather work boots have you covered. They block rain and vent sweat, keeping your feet dry and comfortable. The footbed plus lightweight midsole helps reduce foot fatigue whether you're pulling wire on the job site or meeting up with the guys after work. We are so sorry to hear this. Please contact our Customer Service Department at 1-800-833-3118 for further assistance. I've had these boots about a week. They are very nice looking boots. However, extremely uncomfortable. The big concern though is the exposed stitching underneath on sole near toe area has already become frayed. Ive always been a loyal Carhartt guy. I don't know if sizing is a bit off from what I normally have gotten in the past, but these are the most uncomfortable pair of any boot or shoe I've owned. Have already worn so embarrassed to try to return or exchange, so I guess these will become my mowing or crappy work pair.Total waste of $150.00! I should've went with the 4 inch lightweight pair of boots. A co-worker swears by those! Great boot. A little darker than pictured, but still looks great. Looks great for the office, but still durable for the plant. 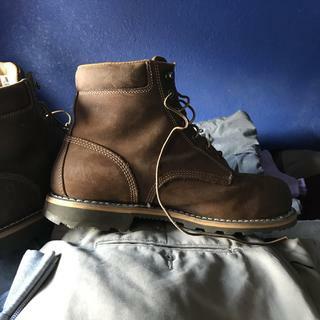 I just got these boots but they seem like they are made well and they are comfortable. I recommend the ‘boot’ because it’s sturdy and the traction in the bottom of the boot is amenable, not to mention the design of the boot is of class. There’s just this that’s seems minute, the color of the boot seems just a little bit darker than it appears to me at least. Other than that, I still give it 5 stars. This is his second pair of these boots. He likes them. His in construction and says they are very comfortable. They are little too big in the heal and run larger than the pair of Carhartt boots I replaced them with. Fit absolutely perfect and feel like slippers with a gel insert in them. Highly recommend to anyone. They fit perfect and look better than photos on here. Nice boots, hope they start feeling better. Bought these boots about 2 weeks ago. I like them, with one exception. I am having exactly the same problem as another reviewer on here. Left boot, big toe area. Rubs and not too comfortable. The right boot feels fine. I don't understand it. Also, I always wear thick socks with my boots. We have contacted the customer to resolve the issue. Great boot, son wanted and loved them. I've had these for two weeks now and they still haven't broken in. I went away for work after buying them and ended up with sores on my toes. Seems to be that the left boot has too much material in the front by the toes and it bunched up causing rubbing. ...would size down from your regular shoe size. If you buy a pair of these and have the same problem, be prepared to spend more money on the thickest boot sock Carhartt makes. After I spent even more money on them the rubbing wasn't as bad. Overall the boot seems to be durable, waterproofing works great and stitching on the outside seems to be good as well. My only complaint is about how the inside was put together. BEST ANSWER: Yes, they are removable. Yes, they are, i tried it as they said, the insoles are removable and the ‘boots’ are amazing ! Yes they are! They're also one of the most comfortable boots I've ever worn. BEST ANSWER: This style will be Brown oil tanned leather. Why not list grams of insulation? BEST ANSWER: This style is not insulated. 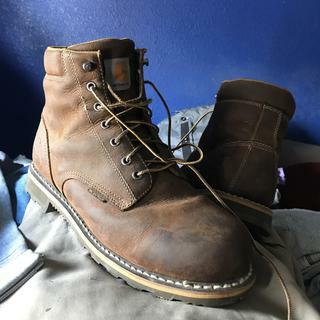 Is this boot made in the USA by Carhartt? BEST ANSWER: This boot is made in China.